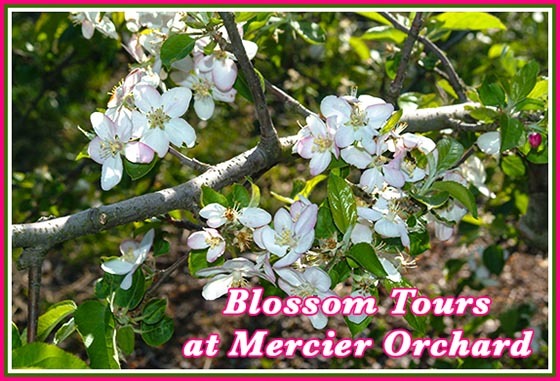 Blossom Tours weekends at Merciers. Saturday and Sunday from 10 a.m. to 4 p.m.� Weather can change everything, blossoms drop sooner, not be ready etc. so it is always a good idea to confirm before making the drive.� This year they expect to start with peach blossoms and go right in to apple blossoms. Beautiful mountain scenery as you ride through the orchards. Tours run each weekend and are weather permitting.� First come first serve.